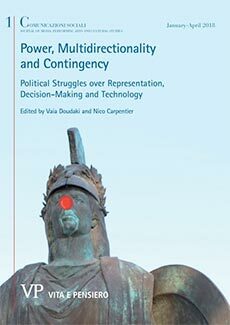 Iconoclastic Controversies is part of a larger study by Nico Carpentier on the politically charged Cypriot landscape and its community media. NeMe hosted the exhibition which consisted of twenty selected photographs and eight sound recordings, and organised a seminar with three speakers. Instead of a curatorial statement about these events, we are publishing an edited interview, broadcast on CUT-radio on 23 January 2016. Yiannis Christidis: Today we have Professor Nico Carpentier in the studio. We are going to talk with him about the exhibition which is now taking place in Limassol, at the NeMe Arts Centre. The exhibition is called: “Iconoclastic Controversies: A visual sociology of statues and commemoration sites in the southern regions of Cyprus” and I would like to start the interview by asking you: How do you explain the concept of the exhibition to a 6-year old child? Nico Carpentier: That is a quite challenging opening question. You should give me time to think about an answer for a couple of hours. No, more seriously, first of all, thanks for having me here to talk about this baby of mine, it is not a six-year old but just a baby of mine. Let me try to explain the concept of the exhibition: An exhibition is a medium, and it tries to tell a story. In this case, it tries to tell the story that a statue is not just a statue. That is actually the simple version, the simplest version I can give you. If I can add another couple of sentences, obviously, I mean: a statue is made in stone or bronze – it has a materiality. It is placed in a particular setting, in the streets of a city or village. It orients your gaze, invites you to look at it. The way that it is positioned is often at a central place where the entire landscape is geared towards attracting your attention. There are lots of things to be said about this material positioning. But, there is another layer – we give meaning to it. Moreover, different people give different meanings to it. We look at it in different ways. If you know the historical context, you will look at it differently. For instance, tourists do not always know that historical context. And if you do know the historical context, then you look at a statue differently, you might understand more. So, a statue is not just this piece of stone, or a bronze object; it is actually inviting you to interpret it in a particular way, on the basis of contextual knowledge that you may, or may not, have. Now, I am not talking to the six year old anymore (laughing). After this answer, one might actually wonder about my capacity to talk to a six-year old. To reassure you, I do know that one does not talk with a six-year old like this. Let me make things worse, and add a few things. There are different meanings. Not everybody agrees on these meanings. You can interpret the statues in different ways. Meanings are not stable; they are not given and fixed in eternity. The statue is an invitation to think about something in a particular way. But an invitation is something that you can ignore. It is something that you can actually deflect. You can think about it in different ways. It is something that is negotiated and not fixed. People have different opinions about what the statues mean. In some cases, they provoke really very strong emotions. But they also provoke different emotions, which are based on different readings. What the exhibition wants to show is that diversity – the diversity of meanings and interpretations – is also present in the Cypriot context. Here too, there are different interpretations at work. The statues sometimes create different invitations. All of them try to communicate something but you can still always reject it. You can refuse. Some of the photographs in the exhibition are actually about this refusal. They are about the refusal to follow the invitation of dominant (nationalist) ideologies. There is one picture, if I can give you one example, there is a picture of a Grivas statue. It is set at the Grivas landing site memorial, on the Chloraka coast. It portrays a child playing there, poking a stick in the bushes at the feet of the Grivas statue. The young child is clearly not in full admiration for whatever the Grivas statue is inviting us to admire in relation to the independence war, and for the sacrifice that is linked to that war. The child is not accepting the invitation of the statue. The photograph that I made, is analysing the rejection of the invitation to pay tribute to Grivas. What the exhibition is trying to explain is this very complex interplay between communicational invitations, acceptances and rejections of dominant meanings. Yiannis: One can wonder whether this invitation is a kind invitation, or not. Because, I mean, when the state is constructing these statues, when they are ordering a sculpture from an artist, it may be a kind of intervention in which other people are not involved. This sort of invitation might be kind of rude. Actually, to me, it is a rude invitation. And maybe it is rude to more than one person? But what I want to find out with my comment is: How do you photographically translate this public intervention? How do you transfer the whole experience, which is located in public space, to an exhibition? How do you take these statues and move them to another medium – photography – and then after this, to an exhibition space. This transition of the public space to photography, and then from photography to a printed version in an exhibition space, is quite a route to take. Nico: Yes, it is a trajectory. Of course, it effects the meanings. Let me to start with the invitation part of your question. I agree with you that the invitation can be rude, but it does not mean that it is not an invitation. It does not mean that you necessarily have to accept the discursive constructions that are embedded in the statue, sometimes created by the state, sometimes also by particular groups in society, e.g., foundations, etc. Some invitations are more open and kinder than others. I fully agree with you. What I want to emphasise with using the concept of “the invitation” is that the communication originating from the statues is not that strong, and its meaning is definitely not a given. It can never be that strong that it cannot be resisted. Their invitations do try to seduce you into accepting particular meanings. Heroism is one meaning which is very present in the Cypriot statues, but it is still possible to use irony and just see a pompous object. Some gaze in admiration at a statue and others see something ridiculous, which does not speak to their life worlds. That is what the invitation does. It does try to push you to see heroism, but you might not accept the invitation. Actually a lot of people do not (any more). The landscape of statues in Cyprus – each with their own invitations – is also characterised by the different (and sometimes contradictory) discursive positions that they embody. If you take one step back and start looking at the Cypriot public space, you see that there are also interventions in this public space that are not driven by the state. That are not even driven by dominant ideologies. That are actually trying to resist the dominant ideology. Public space is not something that the state can totally control. Individuals and foundations can buy pieces of land, get permissions and then use it. But these usages are not necessarily in accordance with government policies, or aligned with dominant ideologies. There is also a more participatory-democratic control over these spaces, even if the government can be a very imposing actor on how we can use public space. That actually brings me to your question about the translation of public space into photography and then into an exhibition, and its particularities. I think that that trajectory is driven by an analytical perspective. That perspective is what is allowing me to transgress these spheres and to move from one sphere to another, from the public space where the statues are situated, to photography where they are represented, and then to an exhibition space where they are contextualised (more). It is the analysis that drives the translation, that made these statues travel through this trajectory. The statues and commemoration sites have been selected for particular reasons, and they are represented in particular ways and for particular reasons. The reasons why they are represented as they are represented through photography is the analysis. It is an academic reflection about the role of meaning through statues in Cyprus. That makes the exhibition specific – it is not a mimetic or exclusively aesthetic representation of statues, it is an analytical exercise in trying to understand what these invitations are about, and how they work. And that is an analytical process. And of course, I am not ignoring that artistic interventions are also analytical and reflexive. But I think that in the case of this exhibition, the balance is different, in the sense that the analysis is much more present. And we should not forget that I am still an academic who uses photography, which renders the analysis more present than usual. Although, I hope that the aesthetic have not completely disappeared from my work, but that is up to people to come and see. Yiannis: How does the genre of photography influence the analysis, of what you want to say about the monuments? What effort did you make during the shooting to exactly capture what you wanted to say? What about angles and perspectives? How did they influence your analysis and how did you use them to analyse? Nico: This question moves us into the back office of both photography and academic analysis. The answer lies in a complicated (and hopefully sophisticated) mixture of all these different components, of the analysis, the technology (the camera), the setting, the light, the angle, the framing, etc. I find it still difficult to get it right, to be honest. But talking as an academic, I think that writing an article this is also pretty difficult, as you are also combining very different elements. What I am doing here, is applying a slightly less common communicational technology in combination with an aesthetic framework to convey the results of an academic analysis. It is just a different language that I am trying to use, in contrast to what academics usually use. Still, I think that there were a few basic guiding principles that I used. I wanted to stay away from the purely documenting approach. Because that would still be the common thing to do. Most academics, when they write articles and use photography in them, they it in an illustrative way. I believe that we can use aesthetics, we can use form, we can use emotions, to convey a message, to communicate analysis. And we can use humour. Yiannis: Yes, humour, I wanted to ask you about that. Nico: Yes, of course. You can use humour for that. Humour is a legitimate communicational tool for analysis, although it is an incredibly difficult one, as one also needs to avoid that things become tacky or disrespectful. But in particular, I think that staying away from the documenting approach was important to me. I wanted to also allow the form, the way you actually capture the statue, the light, the angle, to play a role, but in alignment with the analysis. That made it slightly challenging for me, because I did not want to work with contradictions. That would have been a totally different project. I wanted to tell one story about this complexity of meaning (in relation to the statues) and I wanted to show the diversity of meanings, but I still wanted to tell that one story. I did not want to go for internal contradictions in my story. That would be different analysis and a different format. What I was trying to do is to align the analysis with some of formal components of photography. Trying, in some cases, to enhance some elements by using a close-up, or a particular framing, … There is the photograph of the memorial to the missing in the Agios Alexandros church, with its many little wooden frames where the horizon is used as a formal method. You do not see the end of this dreadful list and collage of faces, it is endless. This photographs does not only show the way the pictures of the missing are displayed in a church in Pyrga, it also represents the societal debate – and comments on that debate – of the missing here in Cyprus. It is again an analysis communicated through that very formal aspect. The photograph refers to fact that, sadly, these people are no longer there, they are beyond of our horizon, but it also comments on the endlessness of the debate about them. Apparently, it has no end. Or better, it seems to have no closure, which is exactly one of the problems of this debate. This formal component interacts with the more textual analysis; supported by other academic publications on this debate. But I try to symbolise my analysis. I think this is the best way I can summarise my work, as I am using these formal elements to symbolise an analysis and to symbolise societal processes through that analysis. I think that is what the exhibition tries to do. Yiannis: It is important to know how to combine these photographs with the textual analysis and what meanings that you want the visitors to understand, in a second reading or maybe in the first reading. Let me ask you this one thing, before we go to the second topic which is more sociology related. Having done the first exhibition in Nicosia and having received all the feedback from this exhibition … From the set-up in that space, in the Home for Cooperation in Nicosia, and the space you have created here in Limassol … How were the photographs organised and how is this different now? Nico: One very quick comment is that there have been two exhibitions and that these are two totally different exhibitions. The spaces are completely different and I was … Actually you guessed what I was thinking about yesterday, I was looking at the main set-up and I was simply taken aback by the differences, generated by different lighting, a different way of organising the pictures and the huge contextual difference between the two spaces, one in the Buffer Zone at the Ledra Palace crossing in Nicosia, and one in Limassol. And, again is important to emphasise how the particular exhibition space influences the story that one tells. After all, it becomes a part of the medium. Actually, more correctly, the exhibition is a medium in itself. One of the things I have learned from this experience is how spectacular the impact of the exhibition space can be, and how you can use exhibition spaces in different ways to communicate your work. One substantial difference, obviously, is that in the Limassol exhibition we are using the basement of the exhibition space as an opportunity to bring in the voices of others. What we have done in the basement of the NeMe Arts Centre is that we have created a series listening posts. There, people can sit down on a bean bag, or at a table, and they can listen to different voices, discussing different dimensions of the exhibition, giving different perspectives on the object of the exhibition. Some of the debates that we organised in Nicosia in November 2015 have been recorded by the Cyprus Community Media Centre, and they are now being made available on the site of the exhibition. Also the seminar organised by NeMe in January 2016, recorded in by CUT-Radio, is being played in the basement. The idea behind that set-up – and I think that this is most important- is that it is not my voice only that matters. First of all, an exhibition is a collaboration. There are many wonderful people that worked with me, and that I worked with, in creating these exhibitions. But what the basement set-up is now communicating, is that are many voices to speak about the exhibition and its objects of analysis. There are many interpretations possible, also of the exhibition. What I do not want to do, is to close off meanings. That is actually the last thing that I want to do. The space here, at the NeMe Arts Centre, is allowing me to emphasise that openness of interpretation much more than before. 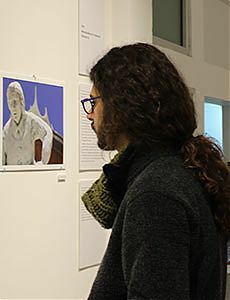 The interpretatory openness, not just of accepting or rejecting the invitations embodied by the statues in always particular ways, but also of the photographs and the exhibition. The process of interpretation is something that I could emphasise much more by using the basement space at the NeMe Arts Centre. At the same time, there are similarities between the two exhibitions. The set-up is still fairly linear, which is a debatable choice I made. The exhibition’s narration is highly structured, probably because that is how I work and think. And it is actually translated into the exhibition. There is a linearity present in the exhibition that combines the textual (through the use of text panels) with photographs, and that tries to create a trajectory within the exhibition space. A visitor goes through the different stages of the analysis. Both exhibitions had this idea of a clear starting point and ending point. Now, I do not think that a visitor is obliged to respect this built-in order. It is one of these debates in any kind of museum or exhibition set-up. How much do you expect visitors to follow a particular trajectory? There is often the tendency of museums and exhibitions to have signs like: “Start Here”, “Walk this Way”, “Exit”, “Exhibition Continues Here”, … All these rather authoritarian signs force people to follow a particular trajectory. At least I was trying hard, to be a bit more open, and used the logics of the invitation here as well. But I am not going to claim that I was using the logic of the “1000 plateaus”, allowing visitors to enter the exhibition at a thousand different entry point. I would not have the audacity to make that claim. This exhibition does have different entry points, but it is still a fairly linear narration at the same time. This raises all sort of questions when we want to talk about which medium is actually more important. Is it the textual linearity that still matters most, in the end? Of course, the photographs are still involved, but what is dominant? Is it the multi-dimensionality of the photographs, that is actually dominating, where the picture literally attracts all the attention and where the written text on the panels, and the order of things, is just secondary? That I find a difficult debate, and I am not sure if I have clear answer to that question. It also depends on the visitor. Some like to be invited into that trajectory, to take the steps as I created them. But still, there is the back door, there are the different entry points, which I see as gates, into the exhibition. But I think that the exhibition’s linearity is still pretty strongly present. Yiannis: And at the same time you are creating an invitation which is more polite than the other invitations we were talking about before. Nico: I definitely hope so. I think that any kind of project created by academics (as academics) has to respectful. They can (and I would say: should) be critical but I believe they have to remain respectful. I do not think I would defend any kind of communicational activity that is disrespectful. I think that is for others, for other people, or for other roles. It definitely makes sense in some cases, but I would not be comfortable with using disrespect in an academic setting, which I think the exhibition is still part of. Yiannis: Just to make a small comment, or two, about the monuments. From what I have seen, because I have had a sneak-preview (laughs) … You see the monuments as generators of audience satisfaction. That is your perspective, and that is your photography. Analysing this tendency of people to follow ideas, in order to get satisfied by certain values – as these ideas can, for example, be called – by the creators of these statues, by the state, or by whoever has intervened to build and create these monuments. Nico: That is a good comment. It is not an easy one to reply to. I would now be inclined to revert to some French theorists, which is maybe not the most polite thing to do (laughs). Yiannis: The six year old is already gone. Nico: He ran away after the first sentence. (laughing) There is the notion of interpellation, and that is what I think that different discourses actually do. They try to seduce us, they console us, they give us ways of being part of something. Discourses are very strong forces because of that. They offer commonality and togetherness, they sometimes drive us to war because others have other commonalities. There is Sam Keen’s quote: “In the beginning we create the enemy.”; “We think others to death and then invent the battle-axe or the ballistic missiles with which to actually kill them.” It shows us how strong these forces, these ideas, can be. We often forget the importance of ideas, not only (by the way) as lethal destructive forces but also as forces of goodness. “Values” is an old term, I prefer to use “discourses”, but basically values are a sub-category of discourses, so let us stick to “values”. These values can create togetherness, they can create solidarity, they can create equality, they can create democracy. But they can also create war and death. They can instigate them. They do have a key role to play in our societies, for the better or for the worse. And yes, you are right, I was actually playing with these ideas in the photography and in the analysis, because what often happens in this kind of discursive struggles is that one particular idea, one particular perspective, gets privileged. And other perspectives therefore become eliminated. I feel uncomfortable with that, in particular when dealing with history. I like the diversity of ideas, and I do not like to have one particular mind-set, or one particular set of values to be imposed, becoming the dominant and only one. If we look at history – because this is an exhibition about history – there is often this emphasis on glorification: On the glorification of the self, on the heroisation of the self, where one party sees itself as good, where its (national) identity becomes articulated as an intrinsically good thing to have. This essentialist identity can then never questioned, or even critiqued. I think it should be questioned and critiqued. Because the logics of glorification and heroisation is concealing a lot of things. This is something that needs to be discussed more, and to be theorised much more. That identity discourse is one reason why I am using photography to talk about these issues, as I want to show the restrictive workings of dominant nationalist identities. But there is more: We need to be careful not to enter into the glorification of war itself. This is something with which I am even more uncomfortable. I am open to discussions about diversity and about the ways that national identity tends to contradict diversity. But I am upset and troubled by the creation of military heroes, which supports the moral acceptance of war (or worse, its celebration). We should not go there. There are a lot of question marks to be placed with these kinds of 20th century (and also 19th, 18th, 17th, … century memorials) as they might convey an undesirable message. Should we not construct a different interpretation, allowing us to rethink these memorials, reconsidering and recontextualising them, because they literally celebrate death and destruction? There is a lot of academic and artistic work on this topic, all over the world. Obviously, Cyprus is not the only country that has issues with this. There is the wonderful analysis of Krzysztof Wodiczko, a Canadian-Polish artist, on the Arc de Triomphe (the Triumphal Arch) in Paris (France). If you start analysing what this particular memorial is actually convening, it turns out to be horrific. It is the purest celebration of militarism you can think of. Maybe we should not be doing these things. Maybe we should raise questions about these memorials, and maybe we should start looking at some of these statues and memorials as problematic, and in dire need of re-contextualisation, exactly because of that. Nico: And in that sense, these statues are pedagogical, to use a more neutral term. Or even better, they have a pedagogical intension. The invitation is also pedagogical in the sense that what is typical for any kind of project like this, is that it wants to transgress time. It does not want to speak about the now only. Memorials want to speak to the future. They want to convince you that the way of looking they embody is the right way. Not just now, but also when you are looking at them in a later stage, looking back at the past. So, they play with time. In very particular ways, and sometimes in very troubling ways. We should not forget the very materiality of these statues. They are set in stone, in bronze. They are fixed. And they also try to fix the meaning of a particular time, though this logic of the invitation. At the same time, their context has changed. People changed, the times have changed. The interpretations have changed, and will change even more. And, at some point in time, the invitation will no longer be accepted. It might not even be recognised anymore. We can see this if you go back to the previous centuries – and I have been doing some research on older conflicts – if you go back to, for instance, the 17th century. A few weeks ago, I was visiting a memorial in Prague (in the Czech Republic), with a group of university students. The memorial was commemorating a battle from the 17th century. Even if people have some knowledge about it, it is hard for them to contextualise it, and nobody has a strong emotional response to it anymore. It refers to the Thirty Years’ War, which was one of the bloodiest wars in that period of our history. However lethal it was, it does not provoke much response anymore, because it is situated in the distant past. Its cruelty has been forgotten. There are other memorials where people are simply ignorant about their meaning and even their existence. They do not have the knowledge frameworks anymore to interpret them. The invitation is gone. It just disappeared, evaporated over time. Even if this can sometimes be reassuring, it is not always a good thing either. Maybe we should not forget, after all, memorial are memories. But I do think that the pedagogical dimension is important if you talk about new generations of citizens. We have to think about what we want to communicate to them and what we want statues and commemoration sites to communicate to them. And this is not a question that stops. It is something that we need to revisit over and over again. As any pedagogical project, we need to think about what kind of story we want them to tell to us. Obviously, this is a very difficult thing to do and it requires a rather intensive reflection. Yiannis: This also applies to the role of public space as a whole, if we connect what you now say with what we have discussed before. Nico: We have this sort of hierarchy in our minds, which I find troubling. We believe that media (and nowadays the Internet in particular) are the centre of our society. We watch television, we surf, or we go on different social networks, and that is how we see and learn about our world. That is of course a myth. Discourses and ideologies work through the interactions of different spheres in our societies. But we seem to cling to this hierarchy. Media are seen to be the top level of the work of discursive construction, and then, maybe, the role of the school, and maybe of religion, and then possibly of public space is acknowledged. Public space dangles somewhere at the very end of this hierarchy. I think that this is wrong. We need to look at different communicational environments, not in hierarchy but in interaction. They work onto each other, they strengthen each other, they contradict each other but they still work with each other. Public space is crucial in that process of signification. We tend to forget this, because, of course, exactly the strength of public space is that it so naturalised. It is normal and unquestioned. If there is a statue there, it is normal that it is there, we do not even see it. If it disappears, we might notice that it is gone. But at the same time, it is a form of continuous communication. Even if you do not notice it, you notice. Yiannis: A form of passive knowledge? Nico: And a form that matters, I mean, in the sense that the public space can be a very strong communicational and pedagogical instrument of power. Again, in our hierarchy of the most important centres of discursive power, we tend to put the media first and forget about the rest. I think that this needs reconsidering. We have to be more careful and acknowledge that public space matters. Yiannis: I want to end this conversation with one more question. How would you explain the concept of the exhibition to a seventy-five year old Cypriot patriot? Someone with very patriotic feelings? Nico: It is a rather good question, because it is very difficult question. I am not sure if I can answer you, but let me try. Earlier, I talked about the need to be respectful and I want to use this idea as a starting point. There is a need to be respectful for the heroism of people. I definitely do not want to reject suffering, and I also do not want to reject courage and sacrifice. Mind you, I have studied war, but I have not been in a war. Still, I might have a vague idea of the intensity of emotions, about the horrific things that happen in war, but also of the most wonderful things that sometimes happen. We should try to understand them in a respectful way. At the same time we need to think critically about the past. That would also be part of my response: Maybe some things from the past need to be revisited and rethought. With respect for the emotions of all involved, with respect for all sacrifices and losses, because war is about loss. But we should also use other values, like humanity, to look back at wars. Maybe also the value of togetherness. Maybe also the value of respect for diversity. I like to see the exhibition as an invitation to go back into the past and see that precious things were lost there. I also see the exhibition as an invitation to think about the future, to create a better and safer future. These losses do not have to occur again. We should keep in mind that the experience of war changes people. War can create traumatised people that continue to live in the past for as long as they live. For understandable reasons – who am I to critique that? But war can also create visionaries for the future. Here, my cultural heritage matters, as I am a Belgian that knows about the impact of the First World War. War can create visionaries that say: “Never again”. “Never again” is an incredibly important lesson that people have learned from the First World War (and from other wars) but that in Europe has been forgotten still too quickly, unfortunately. But the trauma of war can feed into different ways of thinking about conflict and war. Looking at the future, finding realistic ways to prevent this from ever happening again, and maybe even helping others – in other places in the world – to prevent this from happening again, should still be the most important focal point in our thinking about war, I think. That would be my answer to the patriot. We would very much like you to watch this NeMe produced video, presenting footage from the exhibition, uploaded on Vimeo on vimeo.com/155836824.